My kids have all had eczema since shortly after they were born. We have found several things that make the eczema bearable, and one that makes it go away. When my oldest was an infant, my nurse practitioner/pediatrician suggested that I limit my intake of milk and wheat as long as I was breastfeeding. This made a very big difference, and when Faith started eating solid foods we immediately noticed her eczema would get worse if she had milk or wheat. It has been the same for all my kids. (Yogurt and cheese do not bother them, but ice cream does.) I have also noticed it gets worse if they eat peanut butter. Though we can limit their intake of milk and wheat at home, it's difficult when visiting or attending any social functions, so after a snack at church or a visit to relatives, the kids will have a flare-up. I quickly learned to avoid any soaps/shampoos/lotions/sunscreens/handsanitizers that contain sodium laureth sulfate--but I think all public restroom soaps have this ingredient. Their eczema also flares up if they sit in the grass outside or if they visit people in different parts of town, so it seems to be connected to dust or pollen. Mix all the ingredients together, then add to the bath after all the water is run. Soak for at least 25 minutes. By the way, some doctors recommend that kids with eczema don't bathe often. I have found this advice to be completely wrong for my children--daily baths are best, and always long soaks in nice warm water. If you can find California Baby Lavender and Tea Tree Shampoo, it makes a great body wash. Vitacost no longer carries it, but I think Whole Foods does. When the kids have an outbreak that seems to be due to playing in the grass or other outdoor allergens, a helpful over the counter oral medicine is Zyrtec, but it seems that if they take it too many days in a row they get nosebleeds. I try to limit its use to a week at a time, and only if necessary. We have a cortizone cream with aloe in it that is helpful for really awful outbreaks, or if they just won't stop scratching long enough to heal up. The cortizone cream without aloe makes the children scream. I won't use cortizone constantly though. Melaleuca's Renew lotion is great for eczema, but my youngest daughter said it "stings" and she convinced the older children that it stings also (they'd used it every day since birth....and suddenly they wouldn't use it!). At Christmas last year, the kids were eating more cookies than I usually let them have, but their skin actually improved! They were soaking in the tub every day, and they were drinking an ounce of Aloe Life Juice every day. I mixed it with apple juice at first, but then they decided they like it plain. I buy the cherry or papaya flavors. Through the winter, the kids had occasional outbreaks, one especially bad after a playdate at a park across town. But in March a friend shared with me a smoothie recipe with omega oils, and after a week, the kids were healed. It's amazing! Their skin is smoother than it's ever been! I bought the gummy bears with omega oils, but they were not effective. If the kids don't have the liquid oils, they start itching again. I add aloe to the smoothie most days (it's good for digestion) and I sneak in some celery--they can't taste it, but it adds another vegetable to their diet. The best news is that the kids LOVE to drink this and beg for it every day. I add protein powder, so this either accompanies their breakfast cheerios, or makes a great mid-morning snack. Blend in a blender...till blended. The blender can't always cope with the frozen fruit and the celery all at once, but once the fruit and everything else is blended, I add the celery. Sometimes I add a shake of cinnamon or a drizzle of honey. If your kids are used to really sweet drinks like koolaid or soda pop, you may need to add honey or agave nectar. Serve in a glass with a straw. Several years ago I read about half of Julia Cameron's book The Artist's Way. Much of what I read was helpful, but I must have gotten distracted, because I never finished the book. I'm trying again, with the workbook. I'm also reading Leslie Parrott's You Matter More than You Think. It's an interesting and personal look at how a woman's life experiences shape her to make a difference and be a mentor. This week we are listening to a bit of baroque music in the afternoons. The kids all have quiet time, and the music is so soothing for them. It's ideal for me too, whether I grab a quick nap, or spend the afternoon writing and reading. Today the CD is Baroque for Bath Time, which is truly perfect bathtime music, but enjoyable at other times as well. We did a lot of rearranging this week, both furniture and artwork. Now one of the first things I see every morning is my small print of "Fisherman's Cottage on the Cliffs at Varengeville", by Claude Monet. What a peaceful view every morning! Today I'm joining Rhiannon over at Starry Blue Sky and posting my Five on Friday. 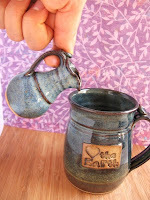 Moorefield Pottery at Etsy makes charming mini creamers--perfect for using as vases or individual syrup pitchers. This week I'm wearing a new fragrance: Mary Kay Lotus and Bamboo. It's very light and summery, and in addition to the body spray there is a wonderful loofah scrub. Another beauty find: OPI nail polish has a color in the "Brights" spectrum: On the Same Paige. It's a bright coral orange, just what I like for summer. I just re-read The Saturdays, by Elizabeth Enright, and the sequels: The Four Story Mistake, Then There Were Five, and Spiderweb for Two. I loved this children's series when I was ten, and I still enjoy them. The children are fun and talented and real, and the author does not limit her vocabulary like the typical children's author of today. The stories are set in the eastern United States during World War II. 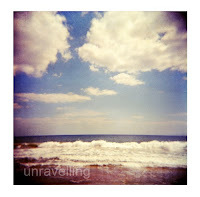 Rhiannon at Starry Blue Sky posts "Five on Friday". I missed it last week, so here are "Three on Tuesday." I bought some classy earrings from Jewelwing Creations at Etsy.com. This seller has lovely necklaces and bracelets too. I discovered a new book blog that looks rather promising: Cabinet of Wonders. I'm in the middle of an interesting book, The Open Door, by Frederica Matthewes-Green. It's a fascinating glimpse of Orthodox faith and an introduction to icons, with inspirational thoughts on various seasonal Orthodox feasts. because they will be filled. because they will be shown mercy. because they will see God. because they will be called sons of God. The Lord is a refuge for the oppressed, a refuge in times of trouble. Happiness in the kingdom of God is achieved by such different attitudes and rules -- different from the world's How to Succeed Rules. Matthew 28:16-30 (CEV) Jesus' eleven disciples went to a mountain in Galilee, where Jesus had told them to meet him. They saw him and worshiped him, but some of them doubted. Though Jesus was ending His time of being physically visible in the world, He promised "I will be with you always." In Hebrews 13:5 this promise is rephrased, and tied to a command: "Let your conduct be without covetousness; be content with such things as you have. For He Himself has said, “I will never leave you nor forsake you.”(NKJV) I'm supposed to be content, because Jesus is with me. He is enough. As the old hymn "How Firm a Foundation" says, "What more can He say than to you He has said, to you who for refuge to Jesus have fled?" He will never leave me. What else does He need to say? Nothing. His presence is enough. Two sites cracked me up today: The "Blog" of Unnecessary Quotation Marks and the sarcastic posters at despair.com.